It does not sign, real estate agency, not a real estate agency, but a concrete man, endowed with knowledge, an experienced specialist in the field of real estate, takes care that they sell or find for you apartment, House or land that suits your needs, expectations and of course financial possibilities. 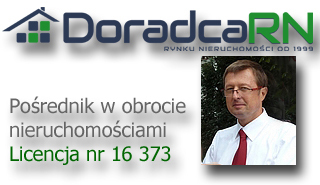 Doradca Rynku Nieruchomości (Real Estate Advisor) Jaroslaw Kantor - broker with professional license for demanding customers, people with both sellers and seeking real estate Poznan. 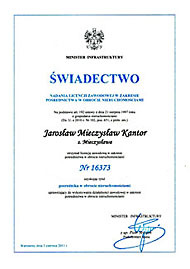 Real estate agent Jaroslaw Kantor on local Poznan real estate market since 1999. Efficiently mediated and effectively advise in the sale /rent/of any home or apartment in Poznan, to clients who can easily go to the dealer with a roll command, as well as through the local press and the Internet. Advisor's bureau team offers comprehensive support for intermediary transactions in sales and renting each apartment houses (free-standing houses, terraced houses, semi-detached houses, serial) and other real estate in Poznan and Poznan's suburbs. Doradca Rynku Nieruchomosci recommends only checked and constantly updated real estate listings. Thanks to many years of work and will be undertaken in cooperation with industry partners on the real estate market, Poznan Real Estate Broker provides the highest competence, high standard and competitive conditions of services offered. For tighter security, certainly should I use the services of real estate consultants with professional real estate broker license. Currently the State licenses in force until the end of 2013 have been recognized without reservation and are honored by the federations and trade associations of intermediaries, so that restoration has kept the ability to verify the competence of the people engaged in this activity. Currently acting as a real estate broker trader requires only compulsory insurance of civil liability for possible damage caused in connection with the activities of the real estate market. For those who care, however, that their cases on the market have people with experience and revised in the years of working knowledge, we recommend using the services of intermediaries with professional licenses, verified by the market, with proven and reliable service.